Wondering how to make a Daycare Business Plan simple by applying no nonsense easy to do research? Here, real people with actual success will show you how to start a daycare without you making the usual costly mistakes. Entrepreneurs are doers. You just want to start your own daycare. Well, Silvia from Bend, Oregon is retired, but still has spirit and a passion for children. Silvia and I chatted recently. I wanted to find out what planning she did prior to starting a home daycare and what she did to make her 9-month old business such a success. Even though you’re here to see how to do a simple and easy daycare business plan, I want to share what Silvia did to demonstrate what a tiny bit of work was done to lay the groundwork for her success. Silva told me the #1 activity she did was to locate all the child day care competitors in and around Bend, find out their hours and identify their cost of daycare. This took her all of three days using the Internet, phone book and asking social service agencies. Her second step was to study her competitor’s websites and make notes. She felt the need to do this because many families, particular young families no longer use the phone book. They seek info via their smart phone. What services would an ideal childcare center offer? Are their services a childcare center could offer that you would be willing to pay more for? How did the parent determine this childcare company was the one for their child/children? Silva checked at the local library to see if there were any newspaper stories in the past two years about daycare in Bend, Oregon. She wanted to see what positive or negative press there was about any childcare service. After deciding to commit herself by starting a daycare center in her home she researched the State and local laws to make sure she would be in compliance and then revised her homeowners insurance policy to make sure she would be covered for any liability. Silvia did not want to waste her time and money in starting a daycare center. So, after research, she purchased for less than $30 the popular, Starting a Day Care Start-Up Guide Kit. With over 10,000 kits now in the hands of entrepreneurs, she wanted to pick the brains of an existing child care entrepreneur, so she could start and grow her home childcare properly. She said it was well worth the investment. Next, she understood she had to organize the administrative details of operating a daycare. While she wasn’t very tech savvy, she found a computer program for about $50 that un-complicated all the record keeping necessary. This, she said, saved her countless hours. She simplified business plan data gathering showed that the most need for childcare was for second shift families. That is, childcare between the hours of 2:00 PM and midnight. Literally, after a newspaper article in the local paper about her and her childcare effort, she had 6 children under her care within 26-days after opening. Today, nine months after starting she has a waiting list of 11 children. She is considering renting a space in a strip-mall, hiring another person and increasing her clients to 12 children. She is having fun. She said she would do nothing different in the planning for her daycare. 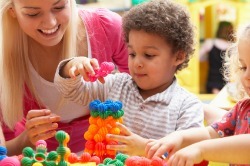 Thank you for visiting Daycare Business Plan: How to Start a Daycare.